Rose hips are the “fruit” of the rose plant--a type of bulb that grows after the rose petals fall off. The seeds of the rose hip contain an oil that is rich in beta-carotene (which the body converts to Vitamin A) and essential fatty acids, such as omega-3 and omega-6. The oil that the cosmetics companies sell doesn't have the scent of roses with which we are familiar, since it is made from a particular wild rose bush from the Andes (the musk rose, or sweet briar), which doesn't have the same fragrance. It can be used for treating sunburned skin, brittle nails, and wrinkles, and is used to reduce aging due to sun exposure. It is also effective in regenerating skin in cases of eczema and dermatitis. 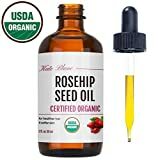 Here is a guide to some of the best rose hip seed oils on the market. Organic, Cold Pressed Rose Hip Seed Oil—Rose hip seed oil that is organic and unrefined retains more of its nutrients and fatty acids. Refining the oil will remove any smell that the oil has naturally. The oil should have a deep amber color. Refined Rose Hip Seed Oil—The refinement process will remove the smell and amber color that organic rose hip seed oil will have normally. Some companies also add a carrier oil, such as olive or grapeseed oil. 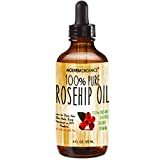 Homemade Rose Hip Seed Oil—Some have seen results from making their own rose hip seed oil—although it contains a carrier oil, like olive oil or jojoba oil. They cook rose hips in a slow cooker on a low setting, pour in a carrier oil, and let the mixture simmer for 4-8 hours. The result is strained through cheesecloth. 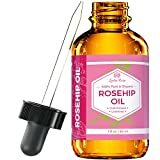 Scent: Some customers were surprised when they found out that the rose hip oil they bought has a somewhat fishy or “earthy” smell. This is actually how it should be. Good for eczema and dermatitis: The fatty acids in rose hip seed oil promotes skin regeneration—this helps combat eczema and dermatitis. Against age spots: The antioxidants in rose hip oil reduces free radicals. Free radicals are theorized to be responsible for the body aging. So rose hip seed oil can prevent those brown spots that occur with age (“liver spots”) due to sun exposure. Makes wrinkles less pronounced: The skin around the eyes is delicate—hence the dark rings underneath the eyes from lack of sleep. It is recommended to rub rose hip seed oil around the eyes, and then to seal in the oil with Vaseline. This makes eye wrinkles less noticeable, and prevents them as well. Moisturizes skin: Rose hip oil is used to heal dry and cracked skin. Nonetheless, it is considered a light oil, in that it gets absorbed into the skin quickly. 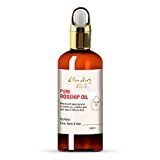 Acne treatment: Rose hip oil applied to the skin of those suffering from acne creates a barrier on the skin, to keep it from becoming dehydrated. The skin produces its own oils to compensate when it's too dry—so rose hip oil will prevent the skin from producing the oils that lead to acne. 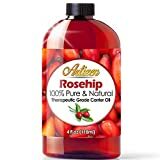 Also, rose hip oil has vitamins that can help the skin regenerate—this will help acne scars fade. 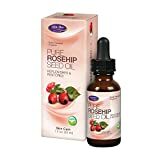 Reduces stretch marks: Just as it reduces acne scars, rose hip seed oil is also used for reducing stretch marks as a result of pregnancy or weight loss. Restores nail cuticles: The cuticle is the skin at the base of your fingernails. They help prevent nail infection. One of the main causes of cuticle damage is dry skin—so applying rose hip oil has been seen to be effective in restoring cuticles. Leven Rose—was founded in 2013 in Colorado Springs, Colorado, by Iyatho Russell. They make a variety of organic oils for skin and hair treatment, that are produced free of parabens, pesticides, and GMOs. Majestic Pure—is based in San Diego, California. They make a wide range of pure botanical oils for cosmetic and pharmaceutical purposes. Pura d'Or—is a brand name of Vital's Cosmetics International, Inc. They were started in 2011 in Orange County, California. They pride themselves on making shampoos, conditioners, and hair and skin treatments from organic ingredients. InstaNatural—started as a small business in Orlando, Florida. Presently they make an entire line of personal care products, with an emphasis on skin care. They strive to use organic and natural ingredients, free from artificial colors and dyes.